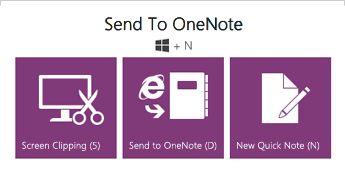 OneNote is a digital notebook for capturing, storing, and sharing all kinds of information. The first thing you’ll see when you open OneNote 2013 is a fresh, clean look that lets you focus on your thoughts and ideas instead of the interface. Full integration with the cloud means you can free your files from your computer’s hard drive so your notes and information are saved and searchable wherever you go — on nearly any mobile device, tablet, or browser. The cloud is like file storage in the sky. You can get to it anytime you’re online. In OneNote, it’s easy to save your files to your own OneDrive account or to your organization’s site. From there, you can easily view, edit, sync, and share your notes and even work together with family members, colleagues, or classmates on the same notes at the same time. When you store your notebooks in the cloud, you can seamlessly access and use the information you care about and keep it in sync across the OneNote apps on all your favorite devices — including your Windows computer, Windows Phone, iPhone, iPad, Android, and Symbian device. You can also use the free Office Online in virtually any browser. And if you have a Windows 8 tablet or slate PC, the Touch-enabled OneNote app makes it even easier to use OneNote on the move. Smoothly draw, erase, and edit with your finger, stylus, or mouse on any Touch- capable device, such as a Tablet PC or a Windows 8 tablet or slate PC. If you need to share your handwritten notes and care about legibility, OneNote can automatically convert your handwriting to text. OneNote automatically saves and syncs everything while you work, so you can concentrate on your thoughts and ideas instead of your files. Use Instant Search to recall anything you’ve ever created or saved in OneNote. 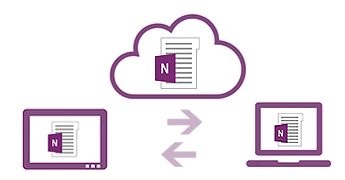 And if you ever need to share a snapshot of your notes with someone who doesn’t have OneNote, you can export your files in a variety of file formats.